Discover our Neighborhood - Arlington, Texas. Our home here in Arlington may be one the most convenient cities for travel in Texas. Arlington is centrally located between Dallas and Fort Worth, and just 10 minutes from DFW International Airport. So, it’s easy to get here—and just as easy to find fun things to see and do here in Arlington. 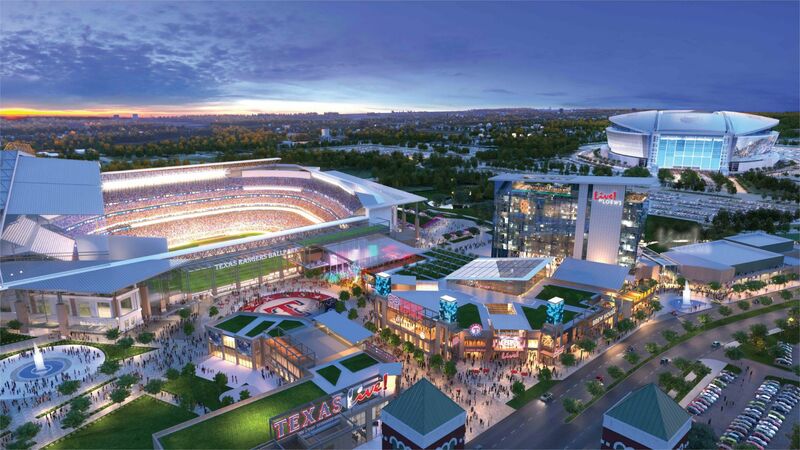 We’ve got the area’s biggest sports arenas right here next to the hotel, as well as a great lineup of new bars, restaurants, shops and event spaces as part of Texas Live!. With Six Flags Over Texas and Six Flags Hurricane Harbor waterpark as our neighbors, Arlington is a great place for kids. Other family-friendly highlights include the University of Texas at Arlington Planetarium and the International Bowling Museum & Hall of Fame. Feel like a spot of retail therapy? Our local shopping hubs include Arlington Highlands for your favorite clothing, beauty and home décor brands, and Grand Prairie Premium Outlets for amazing deals. If creative inspiration is more your speed, the Arlington Museum of Art and The Gallery at UT Arlington are must-see art destinations, and right near the hotel you’ll find the Arlington Sculpture Trail at Richard Greene Linear Park, which showcases a rotation of up to 40 different sculptures. For more fresh air activities, you can book tee time at one of the area’s excellent golf courses—which will soon include the nation’s first MLB-branded course, The Texas Rangers Golf Club—or take a drive out to Lake Arlington for fishing, canoeing, kayaking or paddleboarding. For a list of all the amazing things there are to see and do in Arlington and the surrounding area, simply ask our concierge.